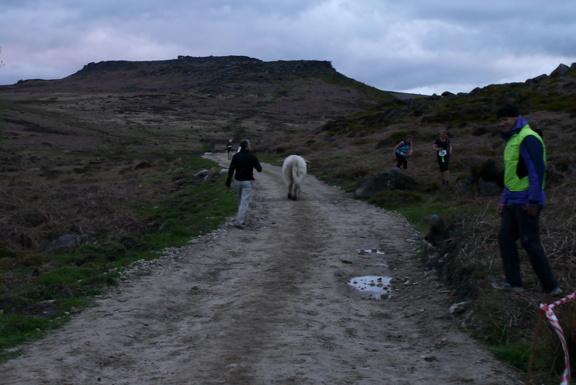 While there was some small race on in the heart of the dark peak, the main event of the day took place on Houndkirk and Burbage moor. 20 hardy souls turned up to put their navigation and mountain craft to the test. Previous weekends had seen glorious weather while out setting the course, but today the weather didn't disappoint. The weather gods dished up wind and rain, turning an otherwise lovely setting into at murky haze. I took those abandoned children (and mine) up as far as Houndkirk Hill for a vantage point to watch the race unfold which proved challenging so we retreated to the comfort of the cars. Only 1 person elected to run the linear course so by virtue of completing it wins the honours for the day in a time 1.36.30. Given my aim for the linear course to be shorter than the score course by at least 20 minutes I may have accidentally sand bagged this one as this was the longest run of the day. So a big well done to Ryan Elliot for the win. The other 19 ran the score course and it was a rather tight affair for the outright win and in the women's race. Jenny pipped Lucy to the win the women's race by 10 points, closely followed by Penny in 3rd. In the overall race Tim Tett edged out a chasing pack of Pete, Simon and Dave by just 20 points, having collected 17 of the 18 controls. I suspect if Pete had made use of his spare 7 minutes he could well have taken the win. There was definitely a clockwise bias from the competitors on the day. With the challenge being how to gather 2 central controls. Having run it in both directions my planners route (anti clockwise) goes something like this: 8,14,9,18,10,4,11,15,6,12,1,16,5,13,7,3,2,17. The reason for this direction was running between control 1, 16 and 5/7 was easier than 9 (or 5/7) to 16 to 1. While using the faster running of the track to go between 9 and 14 and the track between 4 and 11. Certainly making use of the trods for the faster running was beneficial.